No one knows exactly what day it happened, but during the summer of 2011, a custom-built wooden bench magically appeared at The Kindred Spirit Mailbox on Bird Island. It just showed up one day — with no explanation, and no one seeking credit. And what a lovely bench it is! Made from pressure-treated pine, it is well made, solid, stained a light oak and with three coats of polyurethane, it is lacquered to a beautifully polished sheen. And it’s personalized. The words Kindred Spirit are burned into the wood, each letter perfectly formed, in line with the others as if done by a professional printer. The installation is first rate, as well, done by someone who knew something about shifting sands. Its sturdy legs were sunk well into the curve of the dune, giving it a semblance of permanence — even though we all know there is no promise of permanence to anything built on the coast. Well, not one to look askance at a thoughtful gift, we all acknowledged the present and whenever anyone asked how it came to be, both Frank and I said we were sworn to secrecy and pretended we knew who the donor was. We knew nothing. So for three years we marveled over the beautiful bench and accepted and enjoyed the mysterious blessing. Then one day, a few weeks after the “CBS Evening News” interview aired featuring Frank Nesmith and my friend Sandy Payne and me, I received a phone call from Tom Thomas, a gentleman from Atlanta. 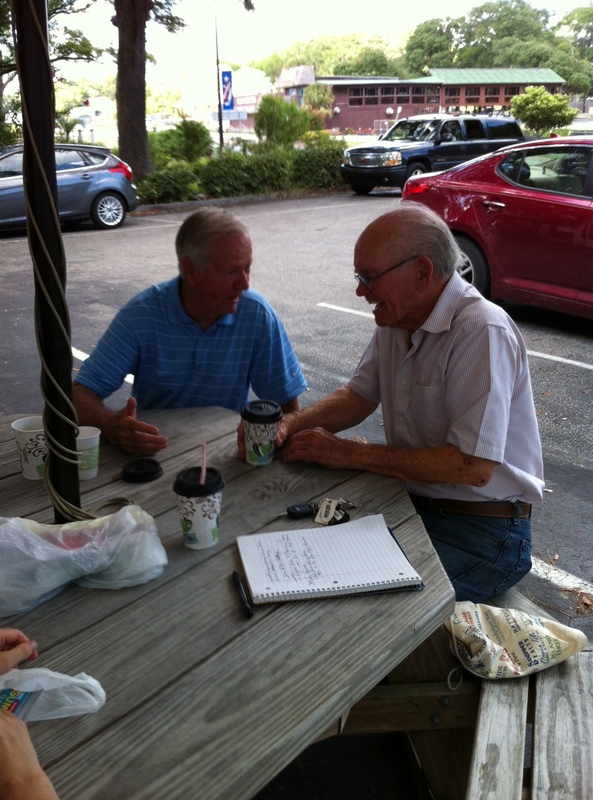 Tom regaled me with stories of his early days visiting Myrtle Beach, S.C., with his uncles, Alfred and Marvin. They drove from Charlotte on summer weekends so the two uncles could go fishing out of Calabash, leaving Tom on his own to explore the little town known as the Seafood Capital of the World. He remembers he hung out at the Red Brick filling station that is now The Grapevine restaurant and he spent time trolling the aisles at Ivy High’s Hardware Store. He was 11 and this was 70 years ago. 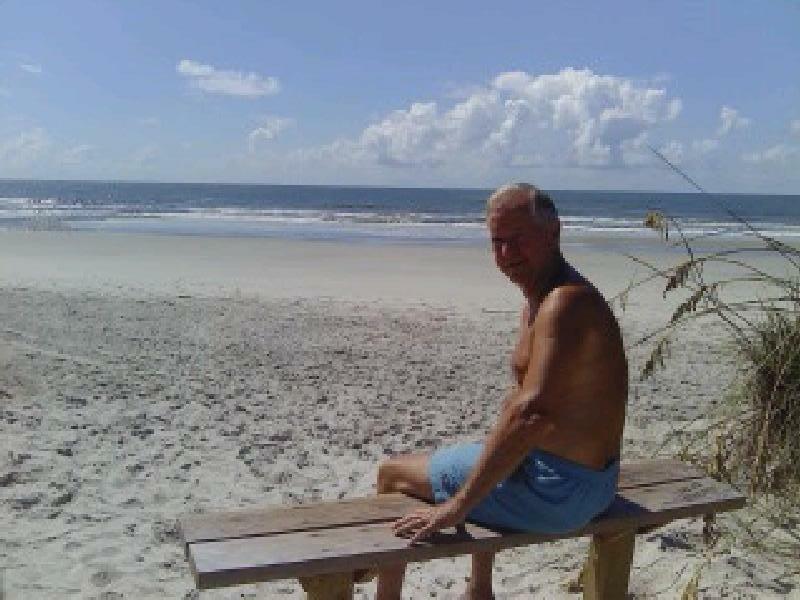 As an adult, he returned almost every year, venturing farther north until 30 years ago he and his wife and their family discovered Sunset Beach. 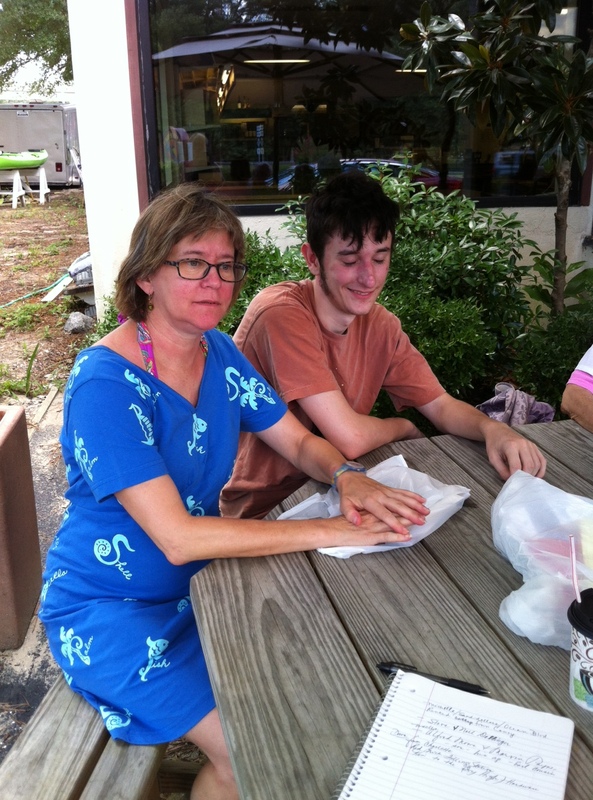 They have returned to Sunset every year since, bringing a variety of people and staying in 30 different beach houses — some of them in North Myrtle Beach, S.C., as they couldn’t always plan their trips far enough in advance to stay at Sunset Beach. In the early years, they rented beach cottages from the Kanoys. One summer, during the ‘80s, they found the beach at Bird Island covered with sand dollars after every low tide. Their favorite thing to do was to go to the mailbox and spend time reading the journals. Before leaving, they wrote letters to the Kindred Spirit. In 2010, it dawned on Tom that there was no bench, that people had to stand or sit in the sand. There actually was a bench, but it kept getting covered with sand, and sometimes it was buried and mistaken for driftwood. The idea to build a bench at home and deliver it the following year popped into his head. And it stayed there, all the way back to Georgia. As a master woodworker, the logistics easily fell into place. He could build the bench in sections and then with screws, bolts, and a socket wrench, assemble it in place. And that’s exactly what he did. Over the winter months he lovingly crafted the bench seat and the legs it would rest upon. Then he borrowed a beach wagon he could use to get both the bench pieces and the hefty pole hole digger he would need down to the uninhabited island. So, like reverse thieves in the night, he and his daughter, Michele, along with his grandson Nicholas (who has been to Sunset Beach every year of his 21-year-old life, including one in utero), drove their van to Sunset Beach, their clandestine cargo safely loaded in the back. They loaded up the borrowed wagon shortly after breakfast, and they began the long trek to Bird Island. 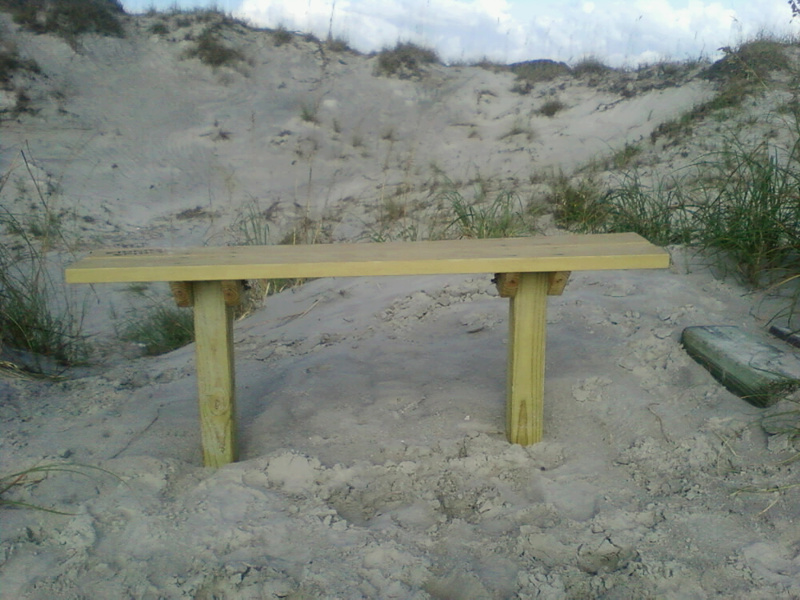 On arriving at the mailbox, they set the legs 24 inches deep into the sand so the bench had a chance of surviving coastal hurricanes. Tom had designed the seat portion with slats to allow for airflow so there wouldn’t be a sail effect for this very reason. Then the pieces were screwed together and the bolts tightened. The anonymous friends from Atlanta had done it. 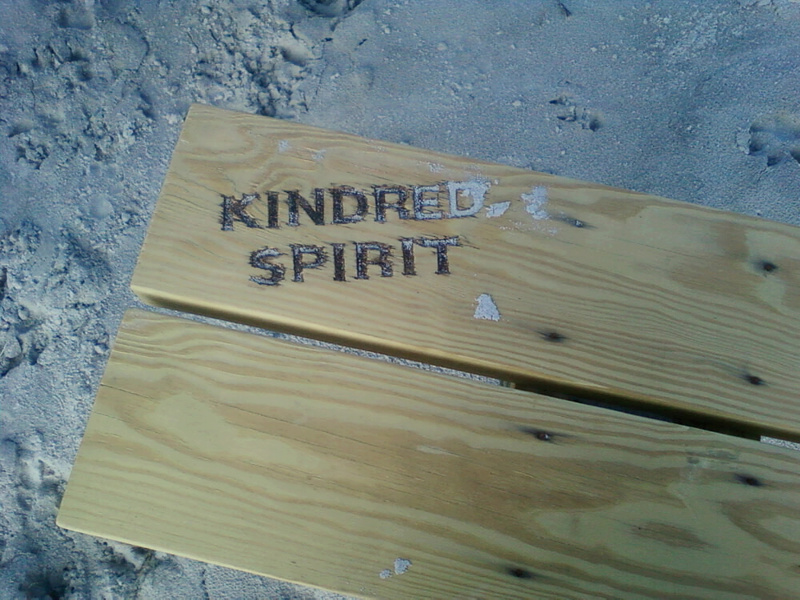 The Kindred Spirit Mailbox had a beautiful new bench. It was christened with a picnic lunch. After meeting this generous and wonderfully kind family, I can only imagine how high-spirited they were as they stole away without leaving a word or a clue . . . to laugh and snicker over their little secret all the way back to Georgia and marvel at the good deed they’d left behind. I can also imagine how they felt the burst of pride over their great success when they saw their bench on the “CBS Evening News with Scott Pelley” three years later. Overflowing with happiness, they finally had to share their mischievous secret. It’s a fairytale too good not to be told. It’s a story of kindred spirits. And that’s exactly what the mailbox is all about: Kindred souls, reaching out with thoughts and feelings — and often finding like-minded people who want to share theirs, as well. Thank you Tom Thomas from Atlanta. You’re an inspiration to us all. Next time you’re at the Kindred Spirit Mailbox on Bird Island, take a peek underneath, at the bottom right corner and you’ll see the initials T.T. Give thanks for the special people who come into our lives in mysterious ways. I’ve enjoyed the bench and it’s beautiful surroundings many times and I am very grateful to Tom Thomas and his family for their thoughtfulness.